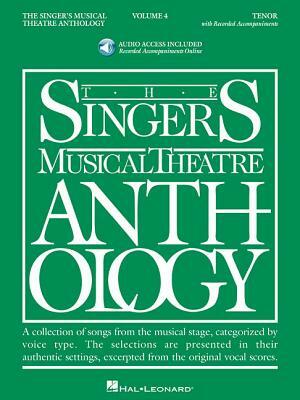 The Singer's Musical Theatre Anthology: Tenor, Volume 4: Book/Online Audio [With MP3] (Hardcover) | The Drama Book Shop, Inc.
(Vocal Collection). The world's most trusted source for great theatre literature for singing actors. The online audio includes piano accompaniments. The book features authentic editions of each song in the original keys. The songs have been carefully chosen for each voice type and are culled from a wide selection of classic and contemporary shows. Contents: AIDA: Fortune Favors the Brave * ASPECTS OF LOVE: Love Changes Everything * AVENUE Q: If You Were Gay * A CHORUS LINE: I Can Do That * A CLASS ACT: One More Beautiful Song * DO I HEAR A WALTZ? : Stay * FLOYD COLLINS: How Glory Goes * THE FULL MONTY: Man, Breeze Off the River, You Walk with Me * A FUNNY THING HAPPENED ON THE WAY TO THE FORUM: Free * GREASE: Beauty School Dropout * HAIRSPRAY: It Takes Two * INTO THE WOODS: Giants in the Sky * JEKYLL & HYDE: I Need to Know * JESUS CHRIST SUPERSTAR: Heaven on Their Minds * KISS OF THE SPIDER WOMAN: The Day after That * LADY IN THE DARK: Tschaikowsky (And Other Russians) * THE LAST FIVE YEARS: Nobody Needs to Know * THE LIGHT IN THE PIAZZA: Love to Me * THE LION KING: Endless Night * LES MISERABLES: What Have I Done, Who Am I? * MOVIN' OUT: Goodnight Saigon * THE MUSIC MAN: Shipoopi * THE MYSTERY OF EDWIN DROOD: A Man Could Go Quite Mad * MYTHS AND HYMNS: Awaiting You * THE PRODUCERS: That Face, 'Til Him * 1776: Mama, Look Sharp * SONGS FOR NEW WORLD: King of the World * SWEET SMELL OF SUCCESS: One Track Mind * TICK, TICK...BOOM : Why * WICKED: Dancing Through Life * THE WILD PARTY: What Is It About Her?, Let Me Drown * YOU'RE A GOOD MAN, CHARLIE BROWN: Beethoven Day.